Easter Seals Yay! Camp Summit, a day camp for children with disabilities between the ages of 6 and 18 in Summit County, takes place from 8:30 a.m. to 4:30 p.m., Monday through Wednesday, from June 8 to Aug. 5. Applications may also be accepted for individuals who are 18 and older, depending on the situation. All activities are in Summit County and range from visits to local ski areas and rec centers to pontoon boating and everything in between. When Breckenridge resident Betty Sarber saw the Summit School District’s budget for next year, she was worried. She saw what looked like a decrease in funding for special education, so she brought her concerns about how that would affect her 14-year-old son — and the hundreds of other Summit County students and families who depend on those services — to the school board meeting on June 9. Another local parent also addressed the board about the importance of seeking family input on disabilities services. The school district recently decided to bring its special education services in-house, explained the district’s director of special education, Mary Kay Doré, and director of business services, Mark Rydberg. They described the move as a positive step for Summit, which won’t notice much of a cost difference but will now be able to tailor services for its students while still collaborating on special education strategies with nearby districts. “If we’re going to spend money on special education, we want it to be as close to our students as possible,” Rydberg said. For decades, Summit has belonged to an organization called Mountain BOCES, or Board of Cooperative Education Services, to provide students with occupational therapy, speech therapy, audiology and other special education services that are difficult for Colorado’s rural mountain school districts to handle on their own. When the cooperative formed 45 years ago, 10 central mountain districts starting paying the organization for contracted services they used occasionally or for a small number of students, similar to an insurance pool. But the region’s population has grown, and, when Eagle County pulled out two years ago, school district leaders in Summit and Aspen looked at whether they also didn’t need the help of Mountain BOCES and found they would benefit from local control. Rydberg said of the roughly $250,000 Summit pays Mountain BOCES each year, about $150,000 were redundant administrative costs that Summit leaders felt would be better spent directly on students. She said in her 18 years with the school district, the percent of students needing special education services has remained at around 10 to 11 percent. In April, that translated to 371 students with mild to severe needs — or roughly 25 to 30 students in each grade, from preschoolers with speech impediments to children with autism and ADHD to teens with Down syndrome and cerebral palsy. Some students with special needs remain with the school district until they are 21 and receive job coaching and help transitioning to adult life. Doré said Summit students with disabilities have been exceeding the state’s graduation rate expectation of 80 percent, and 95 percent have been graduating from high school. Summit students with special needs also score above the state average on standardized tests, and, when comparing those students to themselves year-to-year, they achieve more test-score growth than special needs students in neighboring mountain districts. Still, Summit students have plenty of room for academic improvement, Doré said, and school district officials are happy the separation from Mountain BOCES will allow special-ed teachers, paraprofessionals and other school employees to focus more on that. The coming school year will be transitional, as Summit plans for more individualized state auditing of its special-education services. Doré said staffing will stay the same, with roughly 50 Summit employees working in special education. She said though Summit faces employee-turnover challenges, the district’s special-education providers tend to stick around much longer than other district staff members. Funding also won’t decrease, so students shouldn’t notice a change in services next year or the following after Summit has officially separated, she said. The district is working to improve collaboration with families. Sarber later said she supports the separation. Around 2007, she co-founded a family support group called Families of Exceptional Learners (FOEL), which now includes 17 families and is trying to add more. FOEL wants to raise awareness about people with obvious and hidden disabilities, improve local services and resources and continue building a community that supports people of all abilities. “We’re all differently enabled really,” she said. She praised Summit High School teacher Rhonda Reichardt, who started a class a few years ago for students to learn more about people with disabilities and related careers. Students can go on to participate in a peer buddy program, where they accompany a fellow student with a disability for one class period a day. The program has benefited all the students and their teachers. “I’m so proud of our student body at the high school,” Sarber said. 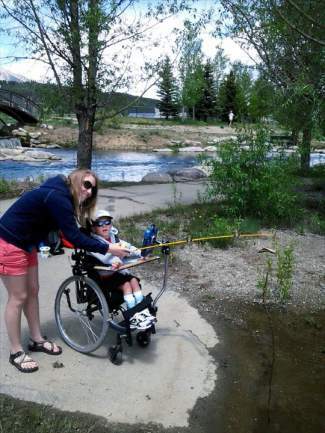 FOEL also partners with the nonprofit Easter Seals Colorado to put on a summer day camp for children and teens of all abilities, some of whom are hard to place in summer camps when they require more supervision and mental, physical and emotional support. Yay! Camp Summit is staffed with a 3-to-1 ratio of campers to counselors. The camp can host 15 kids a day, Sarber said, and currently has about six to 10 registered. The camp costs $50 per day (due a week before participation), and financial assistance and sliding-scale options are available. Campers can participate Monday through Wednesday from 8:30 a.m. to 4:30 p.m., and activities include visits to local ski areas and rec centers, pontoon boat rides and other outdoor field trips. The camp runs from June 8 to Aug. 5, and a $25 registration fee must be sent in with the application. For more information visit http://www.easterseals.com/co/our-programs/childrens-services/summer-day-camps.html or http://www.facebook.com/EasterSealsSummitDayCamp, and contact camp director Holly Long at (303) 941-1062 or hollybugcrazy@yahoo.com or program supervisor Jess MacPhail at (303) 569-2333 or jmacphail@eastersealscolorado.org for applications.